Sooner or later some aspect of a project starts to come undone. Deadlines advancing too quickly, budgets getting out of control, team members concerned about quality, all factors that need attention. Even as a new project manager, the first reaction to trouble should not be blind panic. Every project will have stages when things are likely to go wrong, even if it is just the weather not cooperating with a building project. Getting used to this is one of the first steps towards effective project management. There are usually four categories of things that go wrong with a project. These are budget problems, quality, missed deadlines and market conditions making your project unnecessary or no longer compelling. 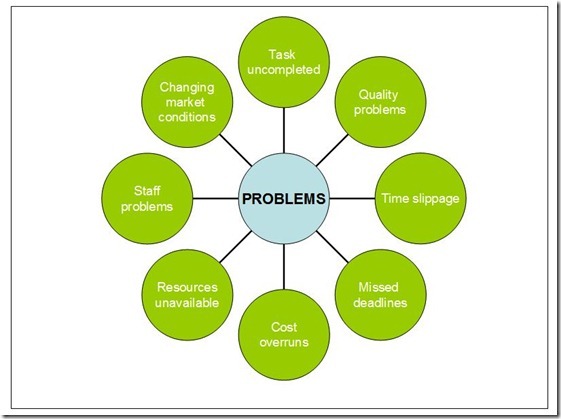 Don’t be surprised if you see some of these problems on your project. Some level of difficulty is to be expected with almost every project. The exceptions of course are when projects have an unlimited budget, very flexible timelines or a very drawn out schedule. The more aggressive projects are usually the ones that have the best managers working with them. Staying on top of the project schedule and status is obviously one way of ensuring that problems are brought to light as early as possible. It is always easier to deal with difficulties and emerging problems if they are noticed as they emerge. The best project managers will even look for trouble before it starts. Rather like a doctor prescribing preventative advice before something more serious kicks in. First step when trouble comes knocking is to take five. Listen to what the problem is, and then ….. long before reacting, take some time to determine the severity. Examine the problem; determine its impact on the project and then start to develop an action plan. Do not panic. Don’t overreact and above all, don’t do that in front of the project team or the individual who may have brought this bad news to your attention. On that point, do not shoot the messenger either, as they may not bring bad news to your attention again. Sometimes problems arise because some members of the project team do not see all of the activities or the progress being made. This is often caused by lack of communication with the team, and as discussed in earlier chapters is completely avoidable. If this is the problem, then you, as project manager are the problem. Fortunately this is a relatively easy one to fix.